7.50 points at 42 votes (rank 202). 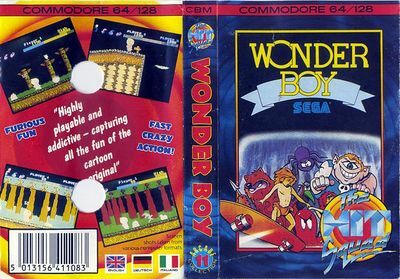 Wonder Boy is a classical Jump 'n' Run, which already was released by Sega as arcade game in 1986. 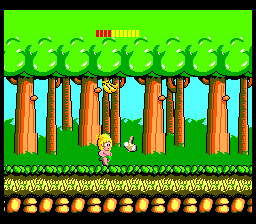 In the game you control a small “Wonder Boy” over a scrolling screen through different landscapes with the aim to rescue his little girlfriend. But the way there is not quite unperilous, as abysses, boulders, fires and many different animals make a stand against the small hero. Fortunately, he also finds useful items as the big “surprise eggs”, that give him special abilities or numerous fruits, which give him back life energy when he collects them. Cleanly scrolling levels from left to right with graphics that seem a bit bold but with fluently animated, colourful sprites. The game consists of seven areas with each 4 rounds which again consist of four parts. After every region an end boss awaits you. The graphics do not change in later areas. If switched on, you will be accompanied by an endlessly playing background tune. While shooting, jumping and collecting food sounds are played. The game consists of seven areas with each 4 rounds which again consist of four parts. The parts are marked on the way with sign posts. Round 1 always plays in the wood, round 2 close to the water, round 3 in a cave and round 4 in a surrounding with mixed background (buildings, wood, wall) and leads to the end boss. When an end boss is defeated, an item needs to be picked up which then is lighted in the upper rim of the screen. On the way to his cutie Wonderboy needs to jump over different platforms and abysses and at the same time defeat all kinds of animals. To have enough energy, he can find food in the shape of fruits, sweets or sandwiches on the way. Furthermore, there are fire and rocks, which block his way. In the upper bar of the screen all the relevant information is shown. With yellow symbols the lives that are left are shown. You can collect more lives that can be displayed. Below this a frame shows, whether you carry the axe or not, next to it you can see 3 of the 7 items you get after defeating an end boss. If you have collected an item, it will be shown in blue. Items that are invisible at the start, will scroll in as soon as it is their turn. In the right part of the upper bar dominates the important energy bar, which must not get empty or else a life will be lost due to “No Vitality”. Above it you can see the current number of points per player or respectively the highscore. Snail It moves towards you and - as it is seemly for it – very slowly. It can only not be met in area 3 and is easy to eliminate. Snake It appears suddenly in front of you, so it is wise to shoot beforehand. It can be met everywhere. Wasp A wasp seldom appears alone – also here in this game. They fly in a hook-shaped manoeuvre towards you and there are two different flying heights. The wasps are not used in area 3. Native At least you have to think of those, when you see the small blue men with the yellow skirt. Two-three of them are on the way towards you in a turning movement. They mainly appear in the wood an at sea. Spider They also are not alone. If you don’t have an axe, you need to jump over some and run fast under some, as they can be placed in different heights. Their moving direction is only vertically and they can be met in area 1, 3 and 4. Purple frog: It sits still and you defeat it with 2 hits (colour changes to brown after the first hit). Green frog: If you get too close or hit it with your axe, it will start to jump towards you. When it is in the air you need another hit to eliminate it. Bat They hang from the walls and start flying towards you, as soon as you get too close. Some of them lie in an inactive state at the ground and can be shot. You mainly meet them in area 3 and 4. Squid They live in area 2. They jump out of the water vertically and you can eliminate them with one shot. Rock Standing stones, that you should jump or else you will lose energy. Rolling stones You can easily jump over them, but they will lose you a life if you touch them. Fire The fire can only be jumped or destroyed when going on the skateboard or having the guardian angel. When you touch it, you lose a life. Egg It can contain different items. (s. below). Energy potion This will completely fill up the energy bar. It appears regularly in area 3 round 3 and before every end boss. Doll It is not hidden in every level. If you collect it, you will get double points for the energy that is left at the end of the round. If you have already collected the doll and get to this place again, you can collect a cloverleaf instead, which gets you 200 points. Extra life It appears suddenly in the game and gets you another life when collected. Spring You need it to make far jumps. Axe Essential for the game. If you have it, you can shoot all animals and free the way through each round. If you don’t have it, it can get impossible to proceed at some places. The axe can also lie around free in the game (e.g. in area 3 round3 and before every end boss). 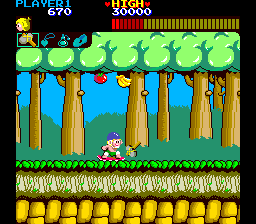 Skateboard If Wonder Boy picks up the skateboard, he gets a helmet and kneepads. With the skateboard the round can be finished faster. However, it dissolves and gives you points after colliding with an enemy. Furthermore, you cannot stop with a skateboard, which makes some situations in the game harder. The skateboard only appears in an egg when you already have the axe. Mushroom When you collect it, all fruits will turn to delicious sweets, ice cream and sandwiches. They not only get you more points, but also more energy. Here also is the precondition that you already carry the axe. Guardian angel With the guardian angel all obstacles and enemies can be destroyed as long as it is on the screen. It only accompanies you for a limited time. Death (ghost with scythe) It constantly deprives Wonder Boy of additional energy. It is not time limited, but disappears when there are only 3 lines of energy left. You need to defeat the end boss with a certain number of hits. The higher the area the more hits you need and the faster will the boss move. The time between the enemy‘s shots gets shorter with ascending area. If you are hit by an end boss you start again at sign post no. 4. If an end boss is defeated, he will lose his head and makes off with a new head that you will meet in the next fight. The head falls to the ground and turns into an item, which you need to pick up. You finally need to leave the level to the right. If you lose a life in a round, you start again at the last sing post that you have passed last. Remember which egg contains the death and try not to open it. An egg can be opened with 2 hits of the axe or by kicking it (running against it). The egg can also be kicked down an abyss and the content is lost. You can run under the green frog with high speed without touching it. The snake is often (not always!) announced by a fruit close to the ground. You can escape the shots of the end bosses by staying close to their body. Per fruit you get 50 or 100 points, when the food was turned into cakes, tarts and ice cream or sandwiches you get 100 to 200 points. At the end of each area a bonus, depending on the rest energy (full energy bar about 10.000 points), which can be doubled by the doll. It is important to eat the appearing food (fruit, cake) to have much time for the level. Further it is important to get and keep the axe, to shoot enemies. Every end boss needs to be defeated with a certain number of shots on the head. If you have defeated end boss 7 you get to your girlfriend. After that the game is over and you get a bonus. Done... the cutie is rescued. Interrupt the game with RESET, then type POKE 2676,205 and restart the game with SYS 2112. The version by Remember offers different options, such as no loss of energy, unlimited lives, always carry the axe, etc . Jodigi: "A really nice Jump&Run game with party tricky situations, especially when the Axe can currently not be used. The music is nice but on the long run a bit monotonous." Shakermaker303: "It’s fun, a nice Jump & Run for in between – but no highlight." 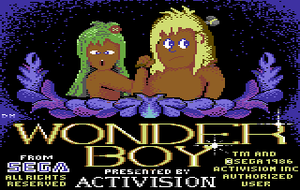 Helmutx: "I loved Wonderboy as an arcade game!!! Unfortunately, the C64 version is not so successfully made." Camailleon: "The arcade machine with Wonderboy was standing in the lido when I was young and sometimes I was allowed to play. When I had the game on the C64 I instantly recognized it. A great Jump & Run with a slightly lower difficulty grade." 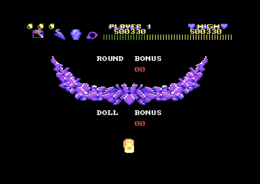 The original aracde version was animated graphically more laboriously than the conversion for the C64. The game principle and the fun did not suffer, the computer games community was generally very satisfied. 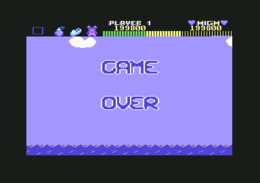 It was also not a too great disadvantage that the C64 does not support a second fire button for jumping. Wonder Boy in the Killer List Of Videogames. This page was last modified on 11 September 2016, at 16:11.